A bright light went out in the quilting world this week. 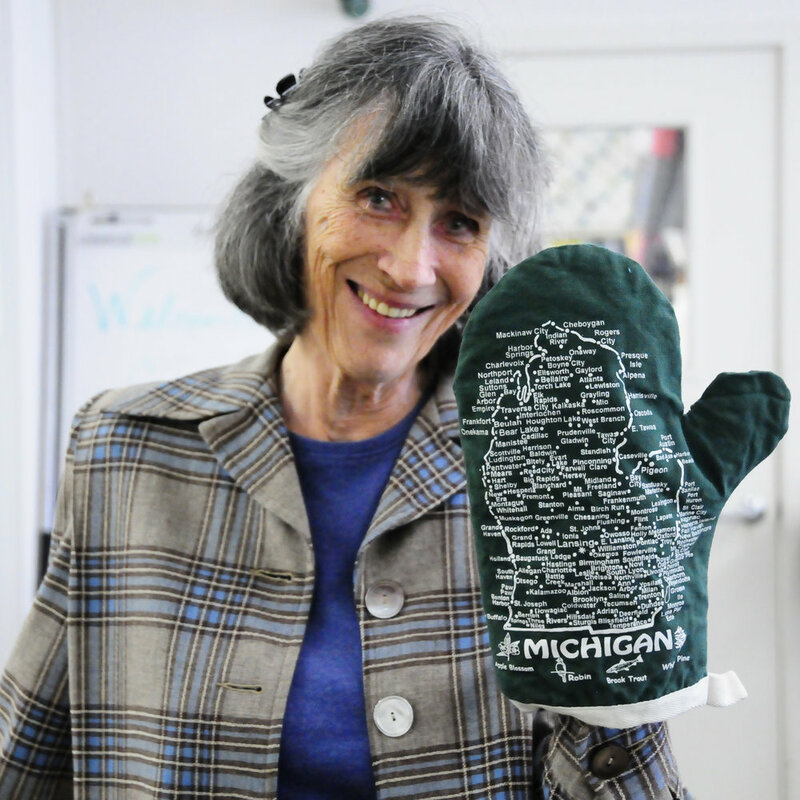 Gwendolyn Joy Marston passed away on Wednesday at her home on Beaver Island, Michigan. All around Instagram and Facebook there are messages of grief and photos of her, but I felt a need to do one more blog post about Gwenny. She radiated joy to all who knew her and she loved teaching. Encouraging the younger generation was something she took terribly seriously and I am so lucky that I was able to benefit from this mentoring. If you would like to make a donation to honor Gwen, here is link to a favorite charity of hers: Oil & Water Don’t Mix. I was lucky enough to call Gwen a friend and it all came about because of the Stitchin’ Post in Sisters, Oregon. I actually first came to know Gwen’s work when I lived in Hawaii in 2002. The local quilt shop on Maui happened to have a couple of Gwen’s books and I knew I’d found a kindred spirit as soon as I started reading her first Liberated Quiltmaking book. If you ever see this book, pick it up. It is a treasure and really, more comprehensive than the later books. I remember reading this one over and over in those early years. When we moved to Bend in 2004 I had no idea how having the Stitchin’ Post nearby would change my quilting life. By that time I had taken tentative steps at some liberated quilt projects. Imagine my delight when finding out at that Gwen would be at the Sisters Outdoor Quilt Show in 2006. I saw her and Freddy Moran give the lecture at the picnic that year. But I didn’t actually meet Gwen until I took my first class with her in 2009. I eventually did finish that first quilt (below) and it’s named A Tribute to Gwen. 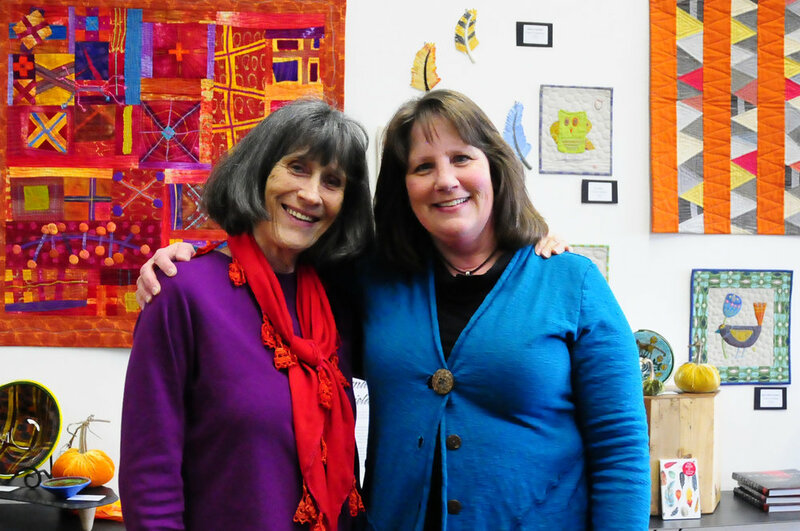 Over the years I took every workshop I could with her and met so many great quilting friends that way. Gwen was the most encouraging quilt teacher I ever had and I knew I was on the right track when she was around. After a while we kept up an email correspondence and I was thrilled when she asked to have some of my quilts in two of her books- Minimal Quiltmaking and Free Range Triangle Quilts. Two friends that I met because of Gwen are Jan and Marion. We first met at a Gwen and Freddy retreat in 2010 and became fast friends. 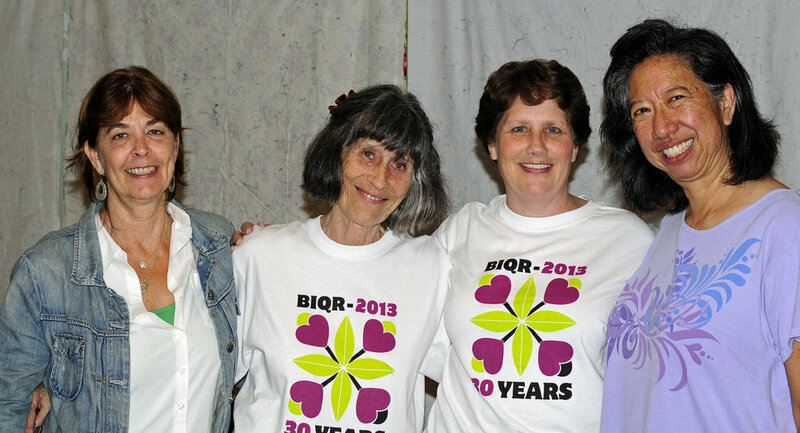 At a later workshop Gwen suggested we three come to the Beaver Island Quilt Retreat in 2013 which was the 30th and final year. We decided to go for it and had the most wonderful time! Even though, by that time, the retreat wasn’t actually on Beaver Island it was so wonderful to see Gwen in her element. 2015 Minimal Quiltmaking workshop, Gwen pointing out my lost triangle points which delighted her! Gwen came to the Stitchin’ Post several times in 2015 and 2016 and I took every workshop she did. Her workshops are always fun, but these were especially sweet as we knew that she was planning to retire and we’d be unlikely to see her again. 2015 Gwen with total focus at the machine. In 2016 Gwen was honored by the Modern Quilt Guild with a special exhibit. I made plans to attend mainly to see her exhibit and went with my friend Marion. It was so nice to see Gwen again down in Pasadena. Her exhibit was beautiful and it made me so happy for her work to be introduced to a whole new group of quilters. I was thrilled to have Gwen there when I won a ribbon at the show. I think she was just as proud as me. It’s totally liberated. Gwen had so many groupies at the show that it was lots of fun. We did a big dinner out and met for lunches on the patio. Later that year in April, Gwen came to Sisters for her final workshops and a presentation called Gwenny’s Night Out. It was bittersweet knowing she would not be back to teach again. In April 2016 Gwen presented her last workshops at the Stitchin’ Post and then did a Gwenny’s Night Out with all her friends. Gwenny was well known for her little stories and jokes and we delighted in them all. She talked about her more recent quilts and life on Beaver Island. It was such a fun night. 2016 Jean Wells and Gwen probably midst joke! That April I had my first gallery show at Twigs which is part of the Stitchin’ Post. It will always mean a lot to me that Gwen was there for workshops and took the time to come to the reception. Without her mentorship I may not have been there in the first place. What fun! The very last workshop Gwen did here was this Free Range Triangles workshop. She kept up her good humor and excellent teaching right through to the end. We all gave her big hugs thinking she’d be back at some point if not to teach, just to see the quilt show or something. Alas, it was the last time I saw her. We did keep exchanging emails, cards, and letters though and I was terribly saddened to hear of her cancer diagnosis last year. She remained cheerful even when her treatment was clearly debilitating. Gwen went to Ithaca, New York for her treatment and to spend time with her children and grandchildren. It makes me happy to know that she had so much quality time with family at the end. I am also comforted to know that she was finally able to get back to her beloved home on Beaver Island just before she died. I know that place meant the world to her. I feel like I’ll still be consulting her in my mind over the coming years. I’ll certainly be going back to her books on a regular basis. Most of all I will treasure all the memories of this vibrant, funny, creative lady. Last week we had a huge snowstorm that went on for several days and in the end we had nearly 3 feet of snow on the ground. It was a record amount for this area and led to all sorts of cancellations. It’s also been so cold since then that not much as melted. Now, a new storm just blew in and we’ll get several more inches. I can safely say that just about everyone is kind of sick of snow. We live so close to the mountains that we’d be just as happy to have it stay there and not come down to town! Anyway, it does give one lots of indoor time to catch up on projects when you aren’t clearing snow. One project I managed to finish is called No Country for Fools. it’s inspired by Temperance Creek by Pamela Royes. This book was chosen by QuiltWorks as an alternative to the Novel Idea book this year. In this case, the author lives in Oregon and she will come to town for the quilt reception and will do an author talk the next day. Here’s a link to the book trailer which is pretty fascinating. Maybe you’ll want to read it too! The title of this quilt comes directly from the book and is a description of the area of eastern Oregon where it takes place. I took one line that the author had about a dream that she is reminded of just as she drives toward her new life in the wilds of eastern Oregon. Her dream was about a crow flying beside her car window as she drove. I used some old shirts that my dad was done with. I cut them into various odd shapes and saved a couple of labels that I incorporated. I combined the shirt fabrics with some Japanese taupes that were in the perfect colors. The background was pieced improvisationally. Then, I appliqued the bird down and added some hand embroidery with embroidery thread (some of which was hand dyed). This piece measures 21” by 24”. I machine quilted it around the embroidery. I would have liked to hand quilt it too, but that would have taken too much time and I am having arthritis issues again so I have to be careful. I really love the fabric that the bird is made from (you can see it up close below). I have this stuff in several patterns and colors and it’s really different from any other fabric I’ve used. I call it bubble fabric, but I don’t know the official name. The pattern is created with texture rather than printing. These fabrics were made by Diamond Textiles and I haven’t seen them in a long time, but they are really great for turned under applique because they are thin, but very sturdy and the turned under edge just holds a crease really well. I added the embroidery embellishment by just following the pattern on the fabric. I washed the old shirts from my dad, of course. But I also didn’t obsess about stains or holes as you can see below. They tell the story of the cloth and the quilt, so I actually highlighted them. I have seen a few of the other quilts in this exhibit, but I am really looking forward to seeing them all up. It should be an excellent exhibit. If you can be there, the reception is Friday, April 5, 5-7 pm and the author talk is the following day. Contact QuiltWorks directly if you are interested. I pretty much always have books on my mind, but even more so right now as I have sold several of my handmade blank books recently. It reminded me of a recent blog post by Sarah Swett (Bookish Thoughts) that made my jaw drop. Please take a look at it and if you like what you see consider subscribing. Sarah’s blog is a new favorite to me, but always beautiful and insightful. I am inspired to try her little woven book covers someday. In the meantime, I have made the hand patterned blank watercolor books you see here which you can find in my KMS Handmade shop. Some have sold already, so look quick if you are interested. I also have plans to make a fabric covered book soon. I want to do a hand stitched cover with watercolor paper inside and I’m still figuring out how to put it all together. In addition to books I’ve been making, I am always reading 2 or 3 books at once. I’m listening to A Gentleman in Moscow by Amor Towles right now (it’s my third time reading this one), because it’s my next Undercover Quilters Book Club quilt book. On this listening I’m making notes in my hard copy of the book of all the passages that speak to me. Later on I’ll go through them and decide which one to base my quilt on. I’m also re-reading my very favorite childhood series of magic books by Edward Eager (start with Half Magic). I discovered my library has them available as e-books and the newest edition of Half Magic has an introduction by Alice Hoffman where she puts into writing all my thoughts about these books and how they shaped me at the age of 10 or so. I tend to read a pretty eclectic mixture of genres. I recently finished several interesting books including The Traveling Cat Chronicles by Hiro Arikawa (utterly charming), Lincoln in the Bardo by George Saunders (somewhat baffling, but it made sense in the end), Educated by Tara Westover (beautifully written, but horrific subject matter), and The Good Neighbor: The Life and Work of Fred Rogers by Maxwell King (learned a lot I didn’t know about Mr. Rogers). I belong to two book clubs. One is pretty traditional and really discusses the book and the other is my quilting group which may or may not discuss the book for a while, but always has fun. I love them both and get great recommendations for books from both. Sometimes it can be hard juggling all the books I try to get through which is one reason I listen to a lot of audio books. I can get a lot of studio work done while listening. It’s the absolute best thing for machine quilting which tends to get boring if I don’t have a book going in my ears. So, how about you? Read anything good lately?